Wagga trainer Chris Heywood and son Nick will team up in tomorrow’s SDRA Country Championships Qualifier after all. The stable’s third runner, Delivered, has been promoted into the field for the $150,000 race, following the scratching on Saturday morning of last year’s runner-up Forever Newyork. “It’s disappointing. He’s had a hoof problem for a while and he’s not 100 percent right, so we decided to turn him out and fix him up,” Forever Newyork trainer, Gary Colvin said. “I just wasn’t happy with his run at Canberra last start and even the run before that (at Warwick Farm) so we made the decision to scratch him. Bryan Murphy will now ride the Colvin-trained Superoo, taking over from Nick Heywood, who switches to Delivered for his dad. That had always been their plan, until Delivered had missed the cut when the final field of 16 was announced. But the first emergency will now get a start. “Yeah, I’m very happy,” Chris Heywood said. Delivered is a $17 chance with tab.com.au. Heywood also has Class Clown (Richard Bensley) at $51 and $13 shot Fermanagh Lad (Adam Hyeronimus) but conceded Delivered was one he really wanted to see take his place. 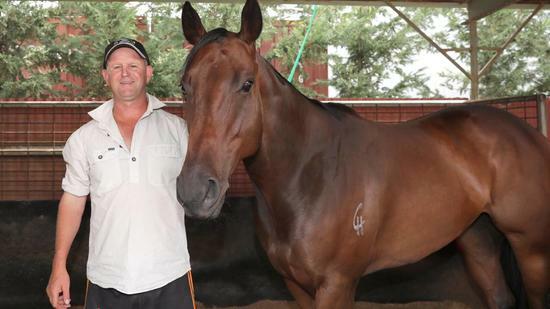 “Look he probably is, he's probably the more genuine 1400m horse out of the three. And I did really set him for the race,” he said. The Bon Hoffa gelding only had four starts last prep – for wins at Leeton and Cootamundra, as well as a second and a fourth in Highway Handicaps in Sydney. Delivered will be second-up after flying late for an eye-catching second at Wagga over 1300m just over a week ago. “He’s normally a horse who gets back and gets home and I can’t see it being any different tomorrow,” Heywood said of their race plan. Colvin’s two remaining runners, Danetrille (Adrian Layt) and Superoo have drawn wide. “I'm very happy with the both of them,” Colvin said. “Danetrille I’ve really freshened up. He just went off a little bit in his last run in Sydney (on February 3) and I brought him home and put him in the paddock for a week. He’s freshened right up and had a nice trial. Scott Spackman’s O’ So Hazy is a $3.30 favourite, ahead Peter Morgan’s Bulala ($4.20).